US 10 leaves Tuscon, Arizona heading north until it collides with Phoenix, where it suddenly points west toward California. As you cross the border, landscapes change in a blink. Broken neighborhoods of the Colorado River Reservation, patches of green in the brown desert, dispel any notion of a modern Tom Joad odyssey into a land of milk and honey. The visible indigence and all its accompaniments, stay with me as the broken thin green belt falls behind. Ahead lies the San Andreas Fault, straddled by the shallow endorheic rift known as the Salton Sea. To the north, imperially looking down, is a place where mountains hover and the Mojave and Colorado deserts merge. A mystical land of boulders and trees seemingly sprung from the imagination of Dr. Seuss. Joshua Tree National Park presents itself as two uniquely different visual experiences. Entering the park from the south, you are met with boulders and brown drapery fold canyons. To the east, below 3,000, the Colorado desert. As you travel northwest and gain elevation, the Colorado meets the Mojave and the transition is abrupt. Cholla cactus gardens fill the Pinto Basin. Otherworldly black stemmed, yellow-green bursts as far as the eye can see. Flatland spreads, bordered by the Pinto Mountains to the northeast and Little San Bernardino range to the northwest. As you enter Wilson Canyon, the giant oddly branching yuccas begin to appear. A single tree here, followed by a grouping there, before filling the desert floor. A forest of randomly spaced, graceful awkwardly branched Joshua Trees. My first thought was wondering how they escaped from Whoville. This was a glorious sight of texture and color, seemingly at odds with everything around them. The trail to Mastodon Peak begins at Cottonwood Springs, in the southern reaches of the park, my home base for the first two days. Hiking through white cindered arroyos and bone dry rolling hills the trail begins innocently enough, before rising steadily. Mojave yucca, dollarjoint prickly pear and skinny ocotillo dominate the landscape. A steady two mile climb leads to the remains of an old gold mine. A dark hole covered by menacing metal bars and the order to keep out. Standing next to the mine were five young people. Two young ladies, Maggie and Cindy and three young men. They struck me as a group that had been in the wilderness before and I introduced myself. Hi I’m Smitty. I am always curious as to what brought someone to the park. In particular what brought young people to the park. I am also struck by the similarity of answers and this was to be no exception. “We’re here to see nature. I mean what’s better than this,” with the flick of a hand. It’s not a bad place to be, I replied. We talked for several minutes about various parks they had been to and why. They lit up when talking about the parks and wanted to know about every park I had explored. We agreed that Carlsbad Caverns was as bizarre a place as you will ever find. I outlined TheMountCo Project and told them how encouraging it was to bump into a group of millennials at the bottom of Mastodon Peak. “Dude, I love what you’re doing.” Then a chorus of approval. The word dude was bandied about. I was slightly embarrassed. So did you guys scramble to the top? “Totally. You gotta go. The view is spectacular. Check it out.” Okay. I’ll give it a shot. We all shook hands and I gave them each a Bearded Man business card which I keep in my backpack. As I made my way to the top, one boulder at a time, I regretted not talking to them longer. By the time I reached the peak, a storm moved across the low Salton Sea in the distance. I looked down the trail, but the group was nowhere to be seen. Looking southwest toward the Salton Sea from the top of Mastodon Peak. You can see the winding trail in the distance. This is Mastodon Peak. You just take it one boulder at a time and hope you don’t slip. That little dot in the middle of the photo is someone sitting at the peak. On day three I woke to a low, dense fog. The remnants of a steady rain during the night. My plan had been to drive north, through the boulders, to the northern entrance near Twenty Nine Palms. Branching out into Hidden Valley and up to Keys View at 5,185 ft. would make a full day. Mother nature had other plans. Desperately needed rain changes the very essence of the park. Roads quickly flood. Brief rivers appear where dry gullies sat listless the day before. Entire sections of the park become impassable. Time to execute Plan B. During the course of this trip, my luck with the weather has been beyond fortunate. I’ve driven over 15,000 miles and less than two hours have been spent driving in the rain. Inevitably in very park I visit, I hear this sentence, “Man, you’re timing is great.” Followed by either, “Last week was rough” or “Next week is supposed to be bad.” Obviously I have no control over the weather, so I study weather charts like a fledgling weatherman. Unlike the east, when you get to this part of the country, parks are numerous and typically only 300-500 miles apart. Which means you can make contingency plans if a front is moving through. My simple point is two-fold. I am lucky and I am now in a part of the country where I can be flexible. Stephen Hawking I do not profess to be, so Plan B was not complex. Execute Plan A as much as possible, given the road closures and fog. First stop, after navigating several flooded roads, was Hidden Valley. A warm-up hike of slightly over a mile, the shrouded trail leads through massive boulders to what was once a hiding place for cattle rustlers. As I’m walking through boulders the size of a Buick Vista Cruiser, scenes from John Houston movies dance in my head. I’m waiting for Glenn Ford to come around the corner, face covered by a red bandanna, guns blazing. Rustlers scramble to their feet, but it’s too late. The very traits that made this a perfect hiding place, make it a trap. Ford lassos the bunch and ties off the rope to his saddle horn. I have to sit to get the images out of my head. Someone once told me I read too much as a kid. But it wasn’t the books that did this to me, it was the movies. First I thought of two rocks in love. Then a larger, weaker rock, leaning on a smaller, stronger rock. Then I saw the side of my head leaning against a fish. Forty Nine Palms oasis is a tough three mile hike, south into the hills. At the end, magnificent California fan palms mark a fissure in the earth’s crust. When water hits a fault plane, it rises. Suddenly, the dusty rock filled path becomes lush. Cottonwoods and mesquites contentedly lounge in the giant palm’s shade. Small orioles rest on branches, lulled by the smooth sound of water. I sat on a rock, in the shade, watching the orioles hop sideways along scaly limbs. Rested, I hiked back to the beginning, with large black ravens for company. Heading west across the park, many of the canyons and folded hills still draped in fog, I decided to drive up to Keys View as planned. My hope was that at 5,185 ft. the outlook would be above the clouds. Just the opposite proved to be true. The higher I climbed the thicker the fog. By the time I got to the top, visibility was nearly zero. Oddly, I was the only one with the ‘above the clouds’ theory. As soon as I opened the door, a cool grayish mist sat on my coat. Everything was damp as I peered into shadows, seeing only outlines, my imagination filling in the blank. The wind picked up and the mist began to sting my eyes. In photos the panorama from Keys View was breathtaking. On this day, it did not exist. So I made my way north to my home for the next two nights, Black Rock Campground. Near the top of Keys View. Visibility about 10 yards. Countless petty crimes being committed in the shadows. Black Rock Campground occupies the northwest tip of the park, about a twenty minute drive from the town of Joshua Tree. A small town with the basics, Joshua Tree has the look and feel of a place that was happy to cease all growth after 1968. Old and new hippies roam freely here. Natural food stores mingle with liquor and used clothing outlets. Faded wooden and neon signs announce saloons and trading posts. With my long hair, scraggly beard and general ratty look, I instantly became a local. I walked the streets for a few hours taking photographs of interesting signs and buildings. Had a slice at Pizza For The People, before heading back to camp. I had a full day ahead and I wanted to map it out. I was also leaving the following morning at 4:30 AM to catch a boat to the Channel Islands, two hundred miles due west. This sign was actually in the neighboring town of Yucca Valley. When I saw the drive-in sign I got all excited. Not to be, just a large flea market selling plastic cowboy boots. After a pure night’s sky of white stars against an ink blue backdrop, the next morning’s sun rose in a dazzling display of color. Neon orange melted into lavender hued pinks under empty bright white clouds. Silly limbed trees stood contrasted against a high deep blue sky. The air smelled of freshly turned dirt. The heavens were apologizing for yesterday and I graciously accepted. Lost Horse Mine sits two miles from the trail-head, snuggled among the dust and boulders. The path once used to haul ore and and supplies is worn and leads through a forest of Joshua trees and cholla, before dipping into a dry wash. Rivulets scrawled in the sand, leave evidence of yesterday’s rain. Hard-pack sits dark stained with water still near the surface, not yet extracted by the sun. As the trail narrows into a rocky sunken path, a rusted car, stripped to the metal, sits silently. Up a small rise sits what was once one of the most prosperous gold mines in the park. Much of the equipment, including the conveyor, remains intact. Behind the mine lies the shell of a pick-up, waiting for its Christine moment. I circled the mine, thinking of a prospector’s life. The hardships that had to be endured. As I hiked back out, I wondered what in today’s world would be the equivalent. All I could come up with was a shoe salesman. In 1890, in this barren land, Johnny Lang and his father drove their herd of cattle into the Lost Horse Valley. They discovered gold. They bought a gaudy house in the Hamptons. On this pristine afternoon, Keys View, unleashed from heaven’s hazy grasp, tested the limits of what my brain can process. To the south, the farmlands of Coachella Valley lean against the Salton Sea and the Sonoran Desert Mountains in Mexico. Across the valley stands 10,804 ft Mt. Jacinto, protecting Palms Springs below her snowy crown. The San Andreas fault carves its path into the sunken floor. I have a fleeting thought of looking out of an airplane. The view is panoramic and staggering. Crests of the Little San Bernadino range, sit one in front of the other. Blue pocked clouds resting on smoothly curved dominoes. Browns melding into deep valleys before finding their way to the blue and white sky. To think that this was all in front of me, covered in clouds a few days ago. Right in front of me. Something of beauty. Something humbling. And yet I could not see. Keys View looking toward Palm Springs. I could see Bob Hope. Keys View looking south toward Mexico. On a clear day you can see forever. A small town in California, Forever has a population of 241. I asked her to please flutter her wings. She did and then tried to nest in my hair. A Mojave yucca. Lime green perfection, dipped in chocolate. On a walk through the high desert I spotted Lin. She is beautiful. Pretty. An introverted extrovert. 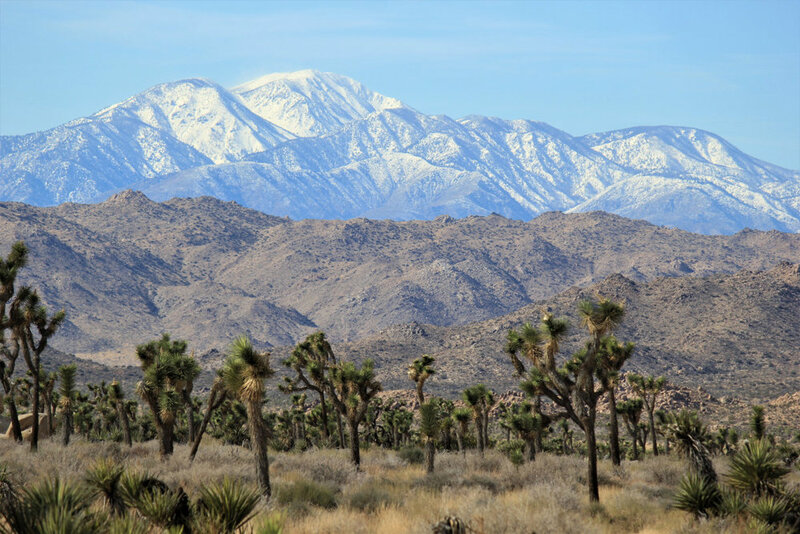 NOTE: For more information on Joshua Tree National Park and all the National Parks and to help with trip planning, download the free Chimani app to your smart phone to easily navigate your way around the park, with or without cell phone service.